ConocoPhillips (NYSE: COP), which earlier this year announced plans to curtail natural gas output in the US, stated that production of the fuel decline by 18,000 barrels of oil equivalent per day in the first quarter. Management indicated that the firm continues to shut-in about 9,000 barrels of oil equivalent per day of production and will contemplate additional measures to limit production in dry-gas plays. EnCana Corp (TSX: ECA, NYSE: ECA), one of North America’s leading producers of natural gas, is on track to reduce its gross production capacity by about 600 million cubic feet per day in 2012, primarily through reduced capital investment and shut-ins or volume curtailments. The number of rigs actively drilling for natural gas in the US has tumbled from more than 900 units in December 2012 to only 588 rigs. 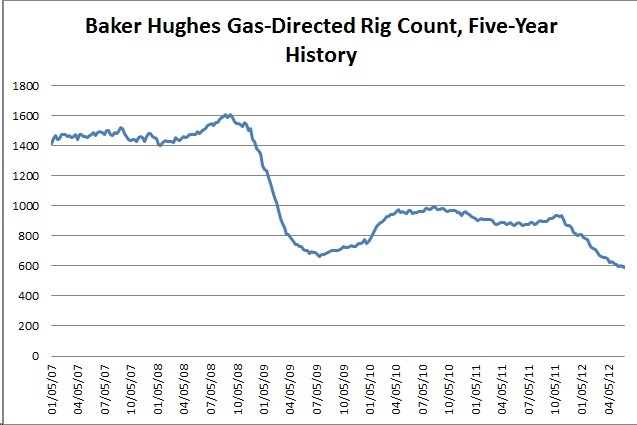 In fact, the gas-directed rig count is lower today than at the height of the 2008-09 financial crisis. With natural gas fetching about $2.40 on the US spot market, producers face a profitability crunch in even the lowest-cost fields. The Energy Information Administration (EIA) once again lowered its price outlook for domestic natural gas in its Short-Term Energy Outlook, May 2012, suggesting that little relief is in sight. The EIA now expects the fuel to fetch an average of $2.45 per million British thermal units (mmBtu) in 2012, down from $2.51 per mmBtu in April and $3.17 in March.